Just over a week ago, in Minnesota DOH: Statement On Cases of Acute Flaccid Myelitis, we saw the first signs of what has become the third fall uptick in AFM in this country since the fall of 2014. Cases were reported in the fall of 2016 as well, while 2015 and 2017 saw relatively few cases (see chart above). This unusual every-other-year pattern is just one of the mysteries behind these outbreaks. Over the past week we've seen reports from Illinois, Texas, Colorado, and several other states - but as with with the previous two outbreaks - no single overriding cause has been identified. Acute flaccid myelitis (AFM) is a rare illness that affects a person’s nervous system, specifically the spinal cord. AFM falls under a broader `umbrella' of syndromes called Acute Flaccid paralysis (AFP). AFM mayfacbe caused variety of factors, including viral infection. While many causes are never identified, we know number of viral infections can increase the risk of AFM. These can include Non-Polio Enteroviruses (NPEVs) like EV-71, EV-D68, and CV-A6, along with others, like West Nile Virus. 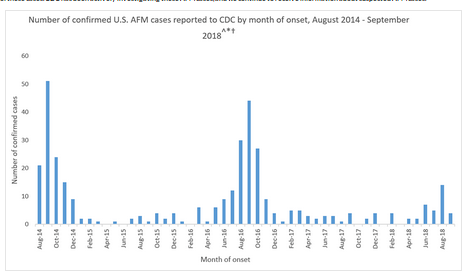 The CDC has been investigating these outbreaks since 2014, and while some studies have suggested EV-D68 as the likely cause of many of the cases in 2014 (see Eurosurveillance Review: Association Between Acute Flaccid Myelitis (AFM) & Enterovirus D68 (EV-D68)) no causal link for most of the cases has been established. The CDC outlines some of the gaps in their understanding of these outbreaks on their AFM Surveillance Webpage. The cause of most of the AFM cases remains unknown. We don’t know what caused the increase in AFM cases starting in 2014. We have not yet determined who is at higher risk for developing AFM, or the reasons why they may be at higher risk. We do not yet know the long-term effects of AFM. We know that some patients diagnosed with AFM have recovered quickly, and some continue to have paralysis and require ongoing care. Today the CDC held a press conference to provide an update on acute flaccid myelitis (AFM) in the United States, and will begin to provide weekly updates starting next Monday. We should have a transcript posted later today, but for now, we are informed that the CDC has 62 confirmed cases in 2018 (up from 38 shown in the chart above), with more than 120 under investigation. The CDC describes this fall's outbreak as similar so far to the 2014 and 2016 outbreaks, although the numbers could go higher. While the Polio virus has been eliminated as a possibility, the etiology of these outbreaks remains elusive. When the transcript and/or audio recordings for today's conference become available, I'll update this blog with a link.